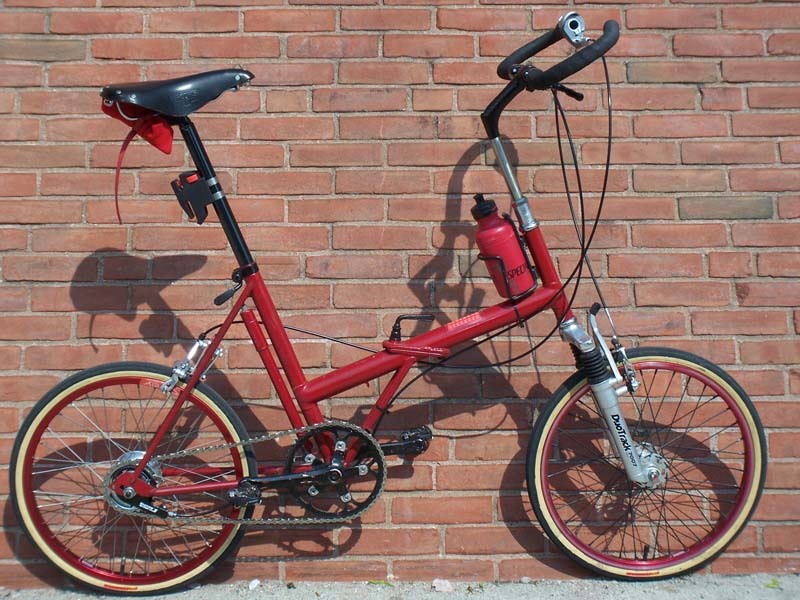 In the '60s, Moulton bicycles were hot in England, and Raleigh wanted to get in on the action. One of Raleigh's answers to the Moulton was the Raleigh Twenty, also known as the Raleigh Shopper, and sold under some of Raleigh's other captive brand names. Some also were made in Canada and New Zealand. 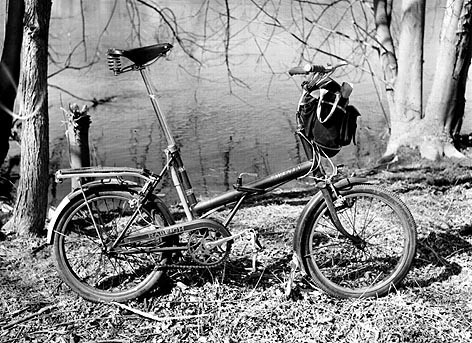 The Twenty was not nearly as sophisticated a design as the Moulton, but there was a visual resemblance. 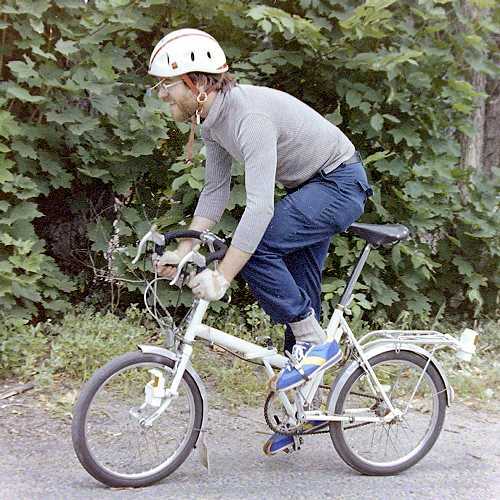 While the Twenty lacked the Moulton's full suspension, it was inexpensive and rugged and fun to ride. The 20-inch wheels were easy to get tires for, and the tires held up quite well. The Twenty superficially resembles many inexpensive European 20-inch folders of the era, but the frame and hinge are much more solid than with most of these. A stock Raleigh Twenty offers performance comparable to that of a 26 inch wheel 3-speed "sports" bike, but, due to its robust, well-designed frame, it lends itself to being "hopped up" in performance by upgrading components. With suitable equipment, it can approach the performance of a Bike Friday at a much lower price. The rest of this article describes features of the Raleigh Twenty and customizing options, then Sheldon Brown's and John Allen's Raleigh Twentys. Use a Phil Wood bottom bracket with Phil Wood 26 TPI retaining rings. Custom-order a long-barrel bracket (made for a 73 mm BB shell), for maximum adjustability of the chainline. The bottom brackets now listed as 68-73 mm on the Phil Wood site are all shorter -- you must ask specifically for the 73 mm shell and hope that it is in stock. The Twenty's bottom-bracket shell's inner diameter is tight and you will probably have to grind away any protruding burrs and ridges inside to install the current, aluminum-shell Phil Wood bottom-bracket cartridge. Install a Velo Orange threadless bottom bracket cartridge. But to do this, you will first have to shorten the bottom-bracket shell (have the ends of the shell faced), as the Velo Orange cartridge is made for a 68 mm bottom-bracket shell. Have the bottom bracket shell re-threaded to take an ISO standard 24 TPI bottom bracket. This works, but the threads are not terribly strong, because the diameter is the same, so there will be some missing threads. (The shells are not thick enough to tap out to the larger Italian size.) You will have to shorten the shell to work with most bottom bracket axles. Warning: the new threads may then extend toward the middle of the shell where there is welding, and the metal may be very hard there. A 7-series JIS square-taper spindle will work with the Raleigh bottom-bracket cups, but usually only if you use 6mm or 15/64" bearing balls and face the BB shell to 71mm. For full detail about these options, see my Article on the Raleigh proprietary threading system and how to work with and around it. The 406 mm wheel models came with loooooong-reach Weinmann sidepull caliper brakes. 451 mm wheel models used Raleigh steel calipers like those on full-sized Raleigh 3-speeds. You can do much better, especially if you also replace the rims as described below. Home-made drop bolts provide a simple and economical solution. 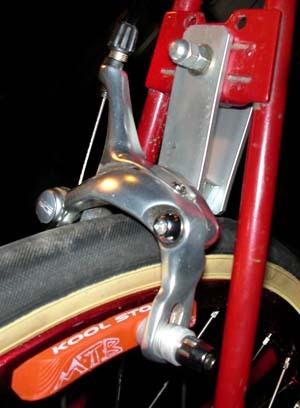 A cantilever or direct-pull brake also works nicely at the front, but requires brake bosses -- so, see the section on forks, below. A cantilever or direct-pull brake at the rear risks foot interference. Drum brakes work better than usual on the Twenty thanks to the small wheels. No brazing is needed if the reaction arm attaches with a clamp. The higher up the front fork blade the reaction arm attaches, the better, to minimize stress on the fork. We don't recommend Shimano Rollerbrakes for a Twenty: the small wheels augment these brakes' light, constant drag. Also, a brazed or welded fitting is required for a front Rollerbrake. A coaster brake also is possible at the rear wheel. It has a constant drag, but much less. A disc brake at the front makes sense only in combination with a replacement fork designed to handle the stress -- generally, a suspension fork. At the rear, a disc brake will require brazed or welded fittings and so, refinishing at least the heated area. Any of the recommended brakes can work well for around-town riding. For speed control on long descents, disc brakes are best, followed by rim brakes. A one-piece bar/stem unit, with bars similar to "all-rounders." These are reasonably light and stiff, and there is no great need to replace them unless you want to go to a totally different style of bar. A tall 3-speed type stem, with a sort of "high rise" bar. These offer fore-and-aft adjustability, but are heavier and less secure than the one-piece type. Both types of stem are secured by an "L" handled binder at the top of the fork steerer, rather than using a traditional expander/wedge system. This binder can be replaced with a bolt, washer and nut, or a seatpost quick release assembly. The stems have a stiff wire loop running out of the bottom, which attaches to the brake center bolt, and prevents the stem from being set too high for safety. Eliminating the wire loop allows you to remove the handlebars and stem and make the bicycle more compact for transport. You may replace the handlebars with any that use a quill stem. This can be secured either by the binder, or by the stem's expander plug/wedge, or both. Because of the low frame, a stem that rises to normal handlebar height will be long, and flexible. The Raleigh's original high-rise handlebar avoids this problem by allowing a shorter stem. You could also invert drop bars, trimming an inch or two off the ends so they don't interfere with your wrists when you are riding on the drops. The ends of the bars face the rear so the hoods are at the top as usual. We're not talking here about the common practice among novices of rotating drop bars so the ends face forward. That's hazardous because braking pushes the hands harder against the brake levers, making the brakes hard to control. Inverted drop bars and short stem on a Raleigh Twenty. making it easy to remove the handlebars and stem for transport. This is possible with many levers designed for the cable to come out at the top. Brompton "M" type handlebars also work well. Most other high-rise bars are very wide, and risk catching on an obstacle or vehicle and dumping you. Even the Brompton bars can stand a bit of shortening: just make sure that there's still room for hardware and a handgrip on the straight part at each end. Twist-grip shifters typically fit flat and high-rise handlebars with a 22.2mm (7/8") diameter at their ends, not drop bars, whose diameter is slightly larger. The stock wheels on U.S. models are either 406 mm (20 x 1.75) or 451 mm (20 x 1 3/8). Generally, the folding models came with the 406 size, which is also the size used for BMX bikes. The 451 mm size is somewhat scarcer. Good rims and tires are available in both sizes, though the selection is much better for the more common 406 mm size. The stock steel rims are very heavy and don't provide very good braking. The most valuable upgrade to these bikes is to replace the rims with lightweight aluminum ones, and to install better tires. Unlike many similar-looking 20" wheel folding bikes, the Raleigh Twenty has a nice stiff frame, and can handle quite well even with heavy riders at high speeds. Twentys are designed to take a 1 1/8" seatpost, and come with a heavy steel one which may not be long enough for taller riders. Long-legged Sheldon used to have to extend the stock seatpost by attaching a smaller seatpost to the top of it, but now, thanks to mountain bikes, and "oversized" designs, suitable modern aluminum seatposts are available from stock for a reasonable price, in the 28.6 mm (1 1/8") diameter. An inelegant but workable solution is to saw a standard 1 1/8" O.D. seat tube out of a trashed frame and use it along with a conventional, smaller-diameter seatpost at the top. If your seatpost has an open top, plug it to prevent moisture and road grit from entering. The seatpost is secured by a collar and a bolt with an L-shaped handle. The bolt may be replaced with a seatpost quick-release assembly. The rear triangle is typical of those made for Sturmey-Archer gear hubs, 114 mm spacing, with 8 mm axle slots. If you want to upgrade the gearing, you will likely need to re-space the frame and file dropouts to accept a fatter axle. Do all of the filing on the bottom of the slot, so you won't disturb the alignment of the rear wheel. It is a good idea to plug the holes in the frame tubes. Unlike with most frames, the chainstays (and with the Twenty, their extension ahead of the bottom bracket) do not drain into the bottom bracket shell. Moisture can collect and rust these tubes out. Also be sure to plug the seatpost, as already mentioned. Some Twentys are non-folding but most are hinged halfway along the main tube. The hinge, with two thick steel plates, is very sturdy and trustworthy. In fact, the bike can be ridden without the hinge "L" bolt (hinge key)! There are threaded inserts for the hinge key in both plates of the hinge, as shown in the top-view photo below. The threaded insert in the lower plate (at the left in the photo) holds the hinge tight, and the insert in the upper plate keeps the hinge key from falling out when unscrewed from the lower insert to fold the bicycle. The photo shows the hinge with the hinge key removed, unscrewed past both sets of threads. The washer shown goes on top of the upper threaded insert and the locknuts to improve engagement. Without this washer, tightening the hinge becomes more difficult. Any 3/8" or 10mm washer may serve as a replacement. The hinge key has 3/8" x 20 TPI threading, a common bolt thread in the U.S. The photo below shows the hinge key with its rubber boot retracted to reveal two locknuts. These allow adjustment so the hinge key faces forward, out of the way when tightened. As shown in the photo, the hinge key has only about 1/2" (13mm) of threads at the end, above that a 5/8" (16mm) long section at the smaller diameter of the thread root, then another threaded section. The unthreaded section disengages the threads in the hinge's upper plate when the hinge key is tightened. The hinge pivots on a stud, threaded at the end, and secured by a nylon locking nut. (See photo below.) Removing the nut allows the frame to be completely separated, as long as no cable prevents that -- possible with a coaster brake and potentially, also a kickback-shifting rear hub -- or if cable splitters are used. At least one Twenty owner had used this trick to fit a Twenty into a suitcase for transport as luggage. If the threaded stud is dislodged, it may fall inside the frame, but it can be fished out and returned to service. Hinge keys haven't been made for a long time, but a length of 3/8" steel threaded rod could be made into a replacement hinge key. The unthreaded section could be turned down, then the handle end heated with a torch, bent over at a right angle and hammered flat. You also need a pair of 3/8" 20 TPI nuts for locknuts. Any bicycle framebuilder or good machine shop can do this work, given the information here. A simpler approach is to use an ordinary 1 1/4" inch long 3/8" x 20 TPI bolt, and to turn down the threads below the head. A lathe works best for this job but the bolt can also be chucked in a drill and a file held against it as it spins. The bolt will need to be tightened and loosened with a wrench. The stock fork is of mediocre quality, but serviceable. It has narrow spacing for a Raleigh proprietary hub, narrower and with a skinnier axle than most modern hubs. The stock Raleigh front hubs are actually pretty decent, but if you want to upgrade to a more modern hub, you will need to spread the fork blades to the now-standard 100 mm spacing, and file the axle slots to fit a 9 mm axle. The image below shows a stock fork as modified by top framebuilder Peter Mooney. He decreased the rake to improve handling, spread the dropouts to 100 mm and added brake bosses and fender eyelets. The brake is a short-reach Shimano cantilever and the fender is SKS with Securi-Clips and and a home-made extender to get the fender closer to the wheel. If you replace the fork, you'll also need to replace the handlebar stem, because the stock stems have no expander/wedge to secure them to a standard fork. The skinny 120 psi Continental tires on Sheldon's fixed-gear twenty were too jarring in the small wheel size, and, though this bike was quite fast for a folder, he found himself rarely riding it, due to the harsh, uncomfortable ride. He solved that problem by installing an SR suspension fork. It made all the difference, following which this bike got regular use. This fork also features cantilever braze-ons, enabling the installation of a Shimano V-Brake. This fork has a long, threadless steerer, but not long enough to use with a threadless headset/stem on a Twenty. Fortunately, the steerer is steel, and of standard wall thickness, so Sheldon was able to thread it. With a threaded headset, there's actually a bit more than enough room, but rather than cut it down, he installed a spacer between the locknut and the adjustable race. The stock Raleigh Twenty headset uses the same bottom section as other Nottingham 3-speeds, with 25 5/32" balls, but the upper headset uses a nylon bushing. The extra friction of this bushing plus the geometry of the stock fork generally make it impossible to ride a stock Twenty no-hands. Replacing the upper headset solves this problem. 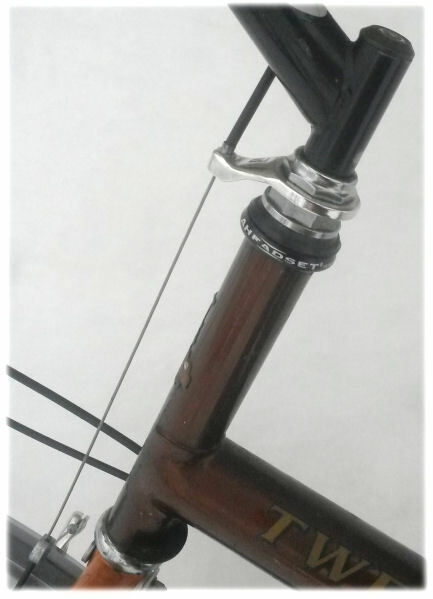 The threads of the stock fork do not extend down far enough to allow installation of a threaded Raleigh top headset -- but, if you replace the stock stem with a quill stem, you can install a 1-inch threadless top headset, and preload it using the top nut and locknut of the original headset. You will need to install a spacer washer and/or brake cable stop to get enough reach. If you replace the fork, you can use a standard ISO headset, because the head tube is standard. The rear rack commonly sold with the Twenty is the classic Pletscher CS rack, very common in the 1970s, still available new as of 2016, but also common as salvage. On most bicycles, the front of a Pletscher rack attaches to the seatstays with a flimsy clamp. The Twenty's frame is equipped with a Pletscher Plate, welded to the seatstays and with holes for the two bolts at the front of the rack. This makes a very secure connection. A Pletscher rack made for the Twenty has short struts to fit low over the Twenty's small wheels. You are unlikely to find a replacement Pletscher rack with short struts, but in any case beefier struts are a good idea. These may be made by cutting the seatstays out of a trashed steel frame, flattening and drilling the ends. You'll need bolts, washers and nuts to replace the rivets that connected the original struts to the rack. The photo below shows a Twenty with a Pletscher rack that has beefier struts, and a Tektro dual-pivot brake installed using a home-made drop bolt. The back of the Pletscher Plate has a right-angled section so a fender can be attached with a through bolt, but here an angle bracket holds a fender clip. The Pletscher rack is attached with the bolts and nuts at the top of the Pletscher Plate, and the brake bolt (holding a home-made drop bolt) is in between. Sorry,yes, there's dirt. This bicycle gets used! All Pletscher CS racks have a "rat trap" sprung wire clip at the rear. Some also have a pop-up clip at the front, to keep a load on top of the rack from slipping forward. The CS rack has a drilled tab at the rear, but a taillight and reflector underneath the rack, as shown in the photo below, are protected from damage. Angle brackets attach them to the bolts at the top of the struts. The Pletscher rack sits low over the Twenty's small rear wheel and works especially well to carry a load in a dairy crate or cardboard box, secured with bungee cords. A load on top of the rack has much less of an effect on handling than on a bicycle with larger wheels. On the other hand, the lowness of the rack makes it unsuitable for use with panniers. Elevated racks for small-wheel bicycles are available from Bike Friday, among other sources, in case you would like to use panniers. The Twenty was sold with heavy steel fenders. These also lacked the safety release feature which is usual on new fenders as of this writing. 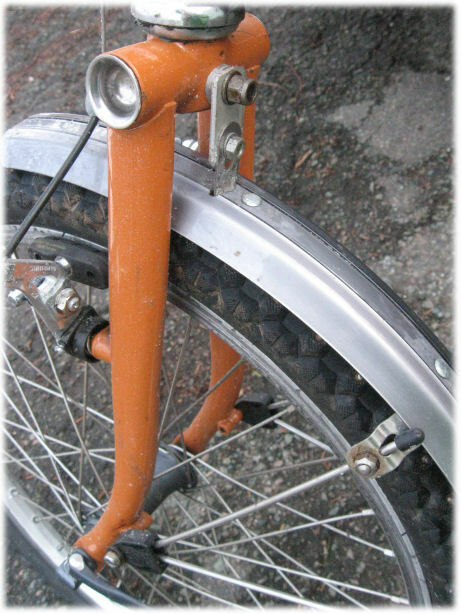 The front fork had no fender eyelets: the fender stays were sequred by the axle nuts. Planet Bike and SKS have fenders for 20-inch wheels. The fender stays may be secured by clips such as those used on chainstays for cables, or by brazed-on fittings as shown in a photo above. The Twenty makes a good all-weather bicycle in more than one way: a rain cape does not cover a headlight mounted at the fork crown. 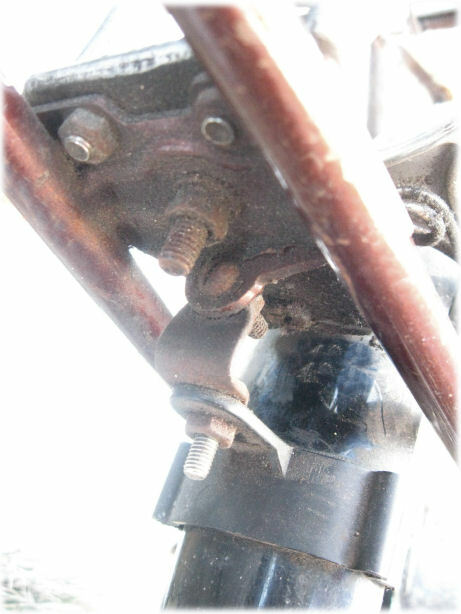 Because of the large clearance around the wheels, extensions to the fender brackets are necessary to get a good fit over the wheels, as shown in the photos above. A hollow spacer with a through bolt is is the way to go at the front of the rear fender, so it sits at an appropriate distance from the tire. For more details, see the article about fenders. The first of many Raleigh 20s I've owned: I bought this one used in the early '70s, and did many modifications to it over the years. In this photo, it was still fairly stock, except that I'd converted the 3-speed hub to 5-speeds, extended the seatpost, and installed Lyotard platform pedals and a Brooks B66 saddle. For a while I had BMX tires on it, and I did quite a lot of off-road riding on this bike, before real mountain bikes became available. It used to really blow people's minds to meet a cyclist out on a hiking trail in the woods...most people at the time assumed that such trails were impassible to bicycles. Later in its life, it acquired aluminum rims, Cinelli handlebars and stem, a Campagnolo Nuovo Record crank set, Phil Wood bottom bracket, and other goodies. One nifty use for such a bike is hitch-hiking. Back when I was a starving hippie, I once used this bike to visit friends on Cape Cod, during the winter off-season. I hopped on the bike at my commune in Allston (an outlying section of Boston), and rode in, perhaps 6-8 miles to the main north-south highway that runs through Boston, and up an on-ramp. I then folded the bike and stuck out my thumb. A hitch-hiker with a crumpled up bike next to him looks less threatening than a normal hitch-hiker, and I got a ride almost immediately, all the way down to Route 6, about 10 miles from my destination. There I was, on a dark November night, on a deserted 2-lane in Cape Cod, with nobody going by. If I'd been purely hitch-hiking, I'd've been S.O.L., but since I had my trusty Twenty, I just unfolded it, turned on my Elite headlight and had a pleasant ride to my friend's house. Later, I lent this bike to one of my partners in the Bicycle Repair Collective (now the Broadway Bicycle School) so he could comfortably hitch back to his home in Minnesota at Christmas time. Worked for him, too! In the early '80s, after I'd married and my daughter Tova was born, this bike acquired a baby seat. I chose this bike for baby-seat use partly due to its sturdiness, partly due to the step-through frame, and partly because it was adjustable so that either Harriet or I could comfortably ride it. Harriet used this bike for her 16-mile commute for quite a while...it was a bit of a "Q-ship". Harriet had a lot of fun blowing off poseurs on thousand-dollar bikes. When you're a poseur with a thousand-dollar bike, and you pass a middle-aged woman on a small-wheel folding bike with a baby seat on it, there's precious little glory, (especially as the only chance these worthies had to pass her was while she was waiting for a red light to change.) On the other hand, once the light changes, and the middle-aged woman on a small-wheel-folder-with-a-baby-seat catches and passes you, you know you've really been passed! S-A 5-speed hot rod, aluminum rims and crankset, wild-looking Uni-disc wheel covers, front and rear, Mitsuboshi Comp Pool tires. This one doesn't have as many lightweight goodies on it as some of mine have, but it's pretty fast on the flats, with the "æro" wheel covers, which have psychedelic dayglo spirals on them...really gotta take a picture of this one sometime. Riding this downhill at speed shows why people don't use disc wheels in front! With the small wheels, it's bearable, but the handling is a bit dicey...as you start to turn even a little bit, the disc tries to make you turn farther, so it takes considerable attention to keep this bike going straight at high speeds. One of my many fixed-gear bikes. This has a modified Haro BMX fork with an extended steerer, Zoom Brahma bars, Araya 7x aluminum rims with 28 mm Continental Grand Prix tires, Sugino cranks, Normandy large-flange hubs, Dia Compe BMX brake. Since the photos were taken, I've upgraded the fork with an SR elastomer suspension fork and a Tektro Mini Direct-pull brake. Featured in Bike Rod & Kustom E-zine! 3-speed hot rod, drop bars, alloy wheels, work in progress. This is a comparatively recent acquisition, and I haven't gotten 'round to doing any serious modifications to this, aside from the drop handlebars...still waiting for inspiration. Tony Hadland's article on the history of Raleigh features historical info on the Raleigh Twenty family.